My clinical trial ended last week, after four weeks of measuring blood glucose variability. I spent four weeks doing BG checks on a meter different from what I use at home. I wore the Dexcom G4 continuous glucose monitor for the length of the study. I’m still not a fan of wearing a CGM. It’s a personal decision… I just don’t like having two things attached to me at the same time. But if I wanted to wear a CGM right now, it would only be the Dexcom. There were four days during the study that I ate the same things, at the same times, checked my BG at the same time. It was weird when those days were work days. Kind of strange going into a meeting and saying, “Hey, I’ve gotta duck out quickly in fifteen minutes. Don’t worry… I’ll be back right away”. I also got a couple of strange looks on those days when the alarm on my phone would go off in the elevator or a quiet moment at my desk (setting the alarm is the only way I’d remember everything on those days). I made two trips from Baltimore to Charlottesville for this study (about 220 miles each way). I spent one night in the team’s research house, and one day in outpatient testing at University of Virginia’s medical center, in the Clinical Research Unit. Oh, and I realized I hadn’t shared the study documentation. So in the interest of full disclosure, from ClinicalTrials.gov, here’s all of the information on my study. Clinical trials are important. They help keep bad ideas from making their way to the marketplace (although, sometimes they still do); most importantly, they help good ideas get the testing they need to make them successful once they reach the general public. As always, I was very happy to participate. And I strongly encourage you to consider participating too. The USA’s National Institutes of Health has a complete list of clinical trials taking place all over the USA, and even some outside of my country. To find them, go to www.clinicaltrials.gov and enter “diabetes” into the search box. A recent search found 10,366 studies. Clinical Trial Update, Week Three. Remember that thing I wrote last week about testing the Dexcom G5? It doesn’t look like that’s going to happen. At least not now. There’s a delay in delivery of the device, and it may not be until next year when it can be tested. I’m finding out that this isn’t uncommon in clinical trials. And my feeling is: Dexcom did a great job developing the G4 and making sure it was ready before it was rolled out. I’m going to trust that there’s a good reason for the delay. Nevertheless, my study continues. The goal is really designed to test glucose variability anyway, and that can be done with or without a new CGM. Last week, I made the drive down to Charlottesville for an outpatient visit to the clinical research unit (CRU) at the University of Virginia Medical Center. The team was kind enough to put me up in their research house (where they do outpatient testing of the Artificial Pancreas) so I wouldn’t have to pay for a hotel room. The next morning, I was at the CRU at 6:30 a.m. I had to be fasting for this test, by the way. Throughout the day, there was a lot of testing going on, but I spent nearly all of my time in a hospital bed, with IVs inserted in both arms. 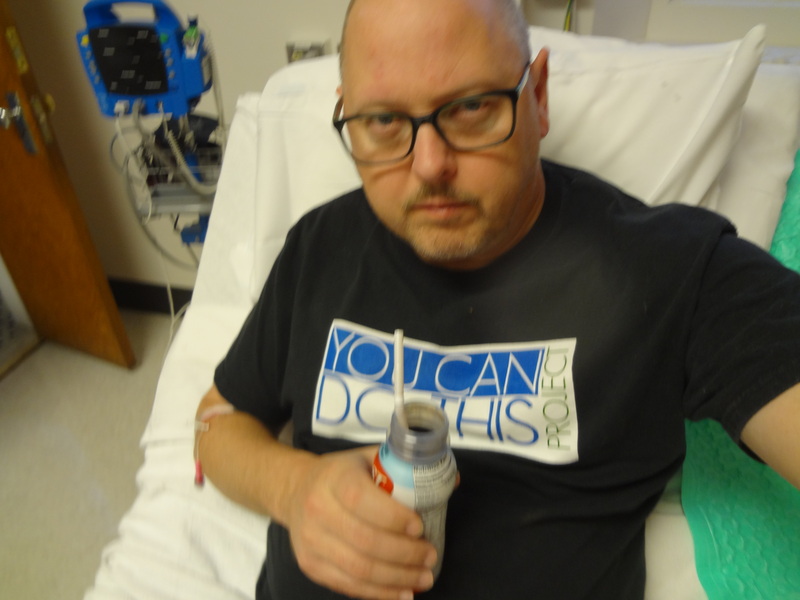 It was a last-minute decision to wear my YouCanDoThis Project T-shirt. I didn’t think much about it when I put it on, but as the day wore on, I think it helped me stay strong. Read on to find out why. There was a lot of blood drawn from those IVs. Beginning at 7:15, they started taking blood out every 15 minutes. The procedure was the same each time: Use a syringe to draw out a little blood, and discard it. Then draw anywhere from 2 CCs to 5 CCs of blood to give to a technician, who gets two BG readings from the sample. Finally, a third syringe is used to inject saline into the IV, so blood doesn’t dry up in the tubing. That’s why the first syringe was always discarded… probably saline in it, which would change the BG reading. Dr. Sue Brown was in the room almost all the time too, monitoring my BGs and making sure things were on schedule, and we were able to share cycling stories throughout the morning. At 8:00 a.m., I was given a carb boost drink (chocolate! ), designed to raise my glucose. It took about two hours, but I eventually got up to 297 mg/dL. Once I leveled off a bit, but while I was still high (around 10:00), I received an injection of regular insulin… right into an IV. Then we waited about two more hours for my glucose to make it down. All the way down to 59 mg/dL. Beginning at 12:00 noon, the team started taking blood out of the IV every 5 minutes until the end of the test at 3:00. You know, it’s a strange feeling waiting for your glucose to go up, knowing there’s nothing you can are supposed to do about it. But it’s even stranger waiting for your glucose to go down. Feeling the effects of hypoglycemia coming on. Feeling the fog entering your brain, and the world getting smaller, and talking about how you’re feeling while all of it is happening (that was not part of the testing– I just shared). After that, they gave me a dextrose drink to help me get up to at least 80 mg/dL. Then another. Once I made it over 80 at about 1:30, they fed me lunch. A cheesy, lemon pasta with shrimp, a great salad, and fresh (no, really fresh) fruit for dessert. As you may have imagined, it was delicious. 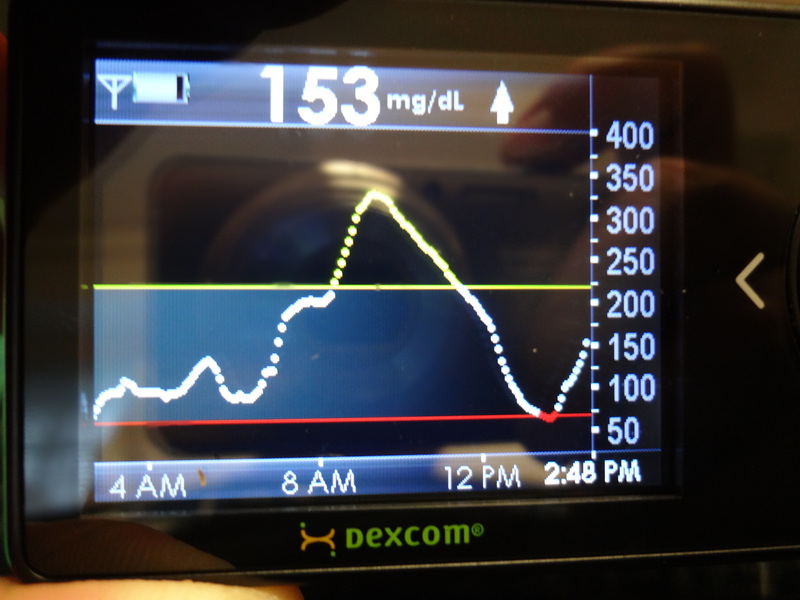 The blood draws and monitoring continued until 3:00 p.m.
Dexcom graph showing my BG variability during the test. So in all, I think there were 56 blood draws, 56 BG tests during my visit. I’ve written about this here so you could get a window into one day of my experience during a clinical trial. They’re not all like this. My previous study didn’t have any days like this. Like I’ve said before, my job is to help researchers move the needle toward better outcomes for People With Diabetes. If that involves testing a website, or sitting still for intentionally induced hyerglycemia and hypoglycemia, it’s worth it because of what it could mean for those who need better outcomes. 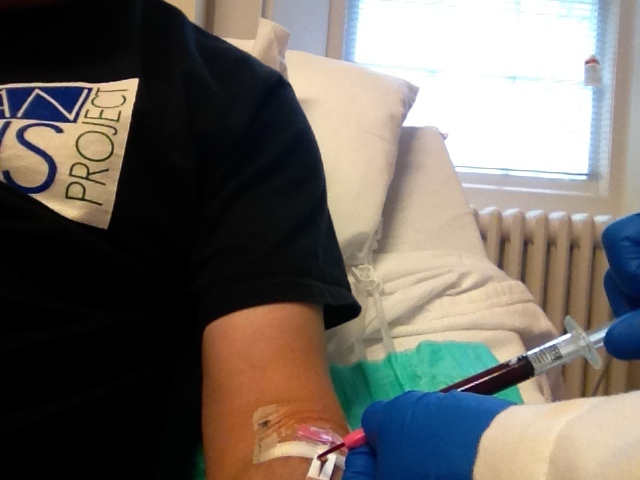 If you’ve been considering volunteering for clinical trials, I hope you’ll decide to do it. If you need help getting started, click the E-mail Stephen link on the top left of this page and I’ll point you in the right direction. So here’s a quick update on my latest clinical trial. Okay, maybe not so quick, but I’ll try to make it as succinct as possible. Officially, I’ll be testing the new Dexcom CGM, the G5. Not sure at this point when I’ll be hooked up to the G5. It’s a 32 day trial. For now, I’m wearing the G4 version, which I will continue to wear for the length of the study. This week, I’m traveling back to Charlottesville to go through a series of tests. On the day of testing, I’ll have an IV in my arm. I’m not sure what all of the tests will be, but I understand part of it will entail getting my glucose up over 200 mg/dL quickly, then dosing me with insulin to bring me back down quickly. I don’t know more about it than that, but I should have a couple of stories to tell later. The team will measure the results, taking blood samples throughout the day. That’s probably the reason for the IV. In addition to all of that, four days of the trial will be “insulin sensitivity days”, which involve eating exactly the same meals and snacks, at exactly the same time, throughout each of the four days. So if I’m eating instant grits and turkey sausage for breakfast at 6:00 in the morning (true), then a ham sandwich for lunch at 12:15, and a granola bar as a snack at 3:00, I have to eat exactly that, at exactly the same time, on the other three days too. The hard part for me is the Stouffer dinner I picked out. Easy to do the carb count, but I’m spoiled… I am not a fan of boxed dinners. What’s the upshot of all this testing? Let me answer a question with a question: Did I mention this version of the G5 is specifically designed to speak to UVA’s artificial pancreas technology? I know I’m connecting dots that are not even on the chart yet, but in short, if these tests are successful, it should help clear the way for at-home artificial pancreas testing. That’s where patients would get hooked up to the AP, then go home for anywhere from a few days to a couple of weeks. That’s a huge leap forward in the development of this important technology, which is why I say I’m connecting dots that aren’t on the chart yet. But I can see the natural progression of the testing, and I can understand that a day like that is coming, and not too far off into the future. Okay, now I am really speculating, so I’ll stop now. I hope to have another update next week… Thanks for supporting me through this important testing! Testing continues. And this time I mean it. I promised more about this when/if it actually happened, so here it is: I began my participation in a new clinical trial on Monday. I’m not permitted to say much about it right now. It’s a 32 day clinical trial testing a new continuous glucose monitor (CGM). I’m basically wearing the current version of the CGM that’s available to consumers today for the length of the trial. For about a week during this process, I’ll be wearing the new, investigative, not-yet-available-to-the-public version. There’s also an outpatient visit with the research team that will involve, among other things, intentionally inducing both hyperglycemia and hypoglycemia. Under professional medical supervision, of course. This ain’t Flatliners, man. That will happen in about two weeks. The interesting thing about this CGM trial is that it could definitely have implications for artificial pancreas testing. More to be revealed on that as soon as I can reveal it. Even though I was bummed about testing out of an artificial pancreas trial, and this opportunity sort of feels like a “lovely parting gift, thank you for playing”, it’s still great that I can participate in this kind of research. Testing the latest CGM technology? Check. Helping AP testing move forward (I hope)? Check. Helping to make things better for People With Diabetes? Check. What more could I ask for? Whether I play a large or small role in research, what’s important to me is that I help move the needle each time I participate, even if that’s just a little bit each time. When I have more to tell, and I’m allowed to tell it, I’ll let you know. End of the line. This time. My clinical trial is over. Last weekend I made the trip down to Charlottesville to wrap things up. The group of us that participated in the trial sat together in a focus group to talk about our experiences as we went about our daily lives during the length of the study. Our group was diverse: Different ages, from different parts of the eastern half of the USA, different walks of life. I loved spending the 2 1/2 hours or so hanging out with them and listening to their stories. In other words, a typical D-meetup, if under different circumstances than usual. One of the things that really struck me was the comments in the group about how we gathered the daily information we entered for each day in the trial. With a couple of exceptions, we all gathered our data the same way. I thought that was interesting in that none of us were told how to gather the data. But because we’re all people with diabetes, we all knew how to get the data the easiest way, and we just had different ways to record it. We talked a lot about the performance of the web-based application we were using. I can’t really reveal any details about that until the study is published… sorry about that. The end of the trial also means the end of my use of the Dexcom® G4 continuous glucose monitor. I never thought I would hear myself saying this, but I miss it already. I’m definitely feeling the withdrawal symptoms this week. When my current CGM’s warranty period is over, I’ll be looking at the Dexcom again. In the end, while I realize that what we accomplished in the trial didn’t move the diabetes needle too far toward a cure, I do realize that it did make a difference. It was truly an honor to participate. I’m happy, especially at this point in my life, to participate in something that might help others like myself. I’m not overstating it when I say that’s a really great feeling. And by the way, I can definitely see myself participating in another clinical trial in the future. You don’t have to always be involved in something that involves investigational drugs that may or may not be successful. Sometimes you’re testing new technology or therapy; or in my case, taking a website for a spin and seeing how it works for your diabetes self-management. The point is, the opportunity exists for you to help move the needle toward the positive side for everyone living with and affected by diabetes. Interested in participating in a clinical trial of your own? The USA’s National Institutes of Health has a complete list of clinical trials taking place all over the USA, and even some outside of my country. To find them, go to www.clinicaltrials.gov and enter “diabetes” into the search box. A recent search found 9,994 studies.